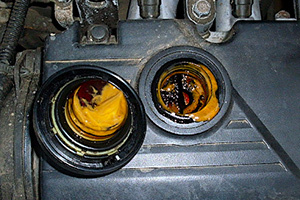 Light deposits (emulsion) under the oil filler cap indicate the presence of moisture in the motor oil. It often happens by continuous driving with the cold engine, especially in winter. Eventually condensed water accumulates in the engine and oil turns into light-beige emulsion. By burning-out of the block gasket cooling fluid may get into the motor oil, which also leads to the emulsion formation. Dark-brown tar deposits indicate severe contamination of the engine oil system. 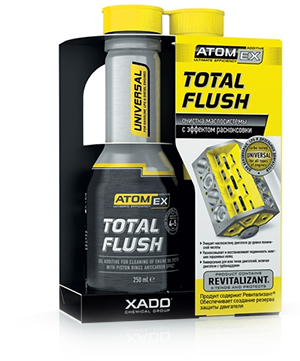 Change the oil and clean the oil system: add VitaFlush – oil system cleaner into the motor oil before change (245-620 miles of run). If such an occurrence is observed in winter and the problem disappears after the engine is warmed up, there is nothing to worry about, it is a normal process.